as a wordpress blogger and maintainer of knowle bases, you probably come accross this problem… you have 3x posts of different quality about the same problem. and you want to redirect 2x posts of bad quality to the 1x of good quality… without any interaction needed by the user. this plugin does it, and i just tested it with version 5.0.3 and it sill works! 🙂 HURRAY! 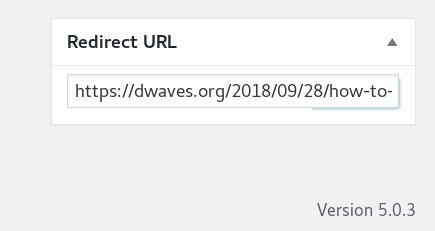 which let’s you specify the url to redirect. thanks all involved and dedicated to well being of conscious life in the universe! K.I.S.S. as much as you can 😀 !